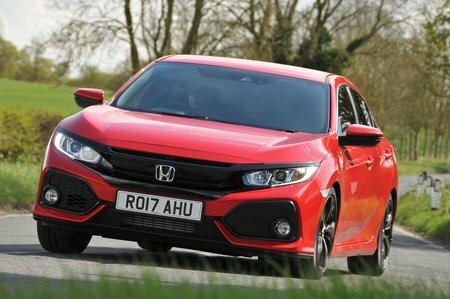 Honda Civic Boot Space, Size, Seats | What Car? The Civic looks fairly compact on the outside but provides plenty of leg and head room up front. 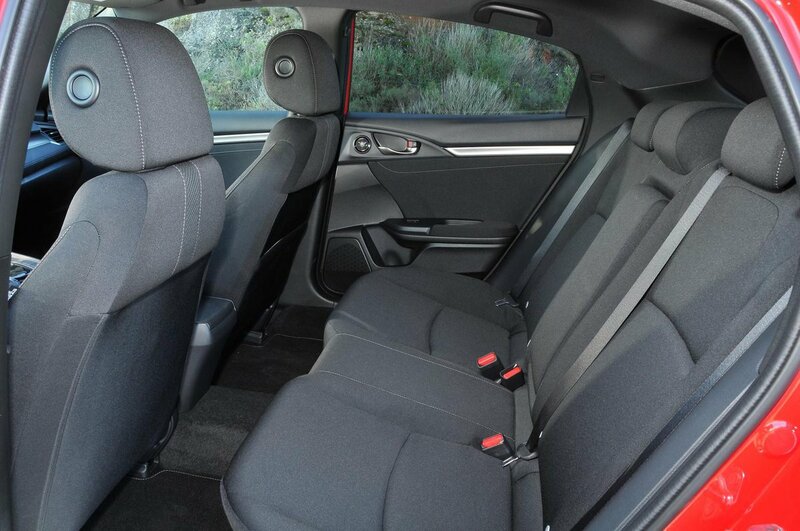 Even taller adults won’t feel cramped, although you will have more space above your head in a Volkswagen Golf. Storage space is reasonably good, with a decent-sized glovebox and door bins that will hold a large bottle of water. Meanwhile, the centre console between the driver and passenger features a cubby/cupholder area with a sliding cover and a large bin beneath the central armrest. Two six-footers sitting behind two similarly tall people won’t have any complaints about rear leg room. 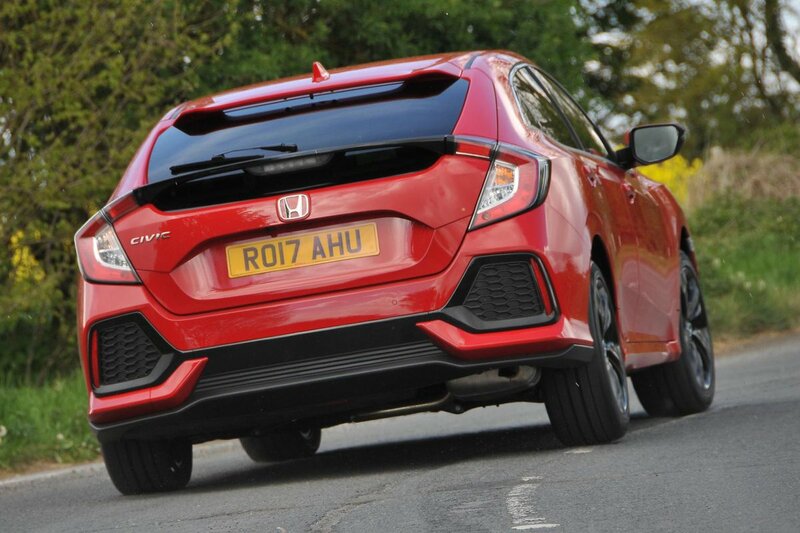 However, because of the way the Civic’s roofline slopes down towards the rear of the car, head room is less generous. Indeed, those nearing six foot may find their head brushing the ceiling. The way the rear side windows pinch in makes the whole rear area feel quite claustrophobic, too. Try to sit three adults in the back and it's a squeeze, while the raised floor makes it difficult for the middle occupant to rest their feet. Each rear door does at least come with a decent-sized pocket that will take a medium water bottle with ease. The Civic’s seating flexibility is nothing special. All versions come with 60/40 split-folding rear seats as standard that lie completely parallel with the boot floor once folded down. However, the seats don't slide back and forth or recline, and there's no folding front passenger seat to allow you to carry really long items. It’s also a shame that Honda has done away with the previous-generation Civic’s cinema-style Magic rear seats, which had bases that flipped up to allow you to use the rear seat area for extra storage. At 478 litres (including underfloor storage), the Civic's boot is larger than that of the Golf or a Seat Leon, but the Skoda Octavia's boot is bigger still. The Civic's load bay is easy to access, though, and isn’t too far from the ground. There are some useful touches, too, such as a 12V power socket inside. It's just a shame that there's a big lip at the boot entrance. It’s also worth bearing in mind that Sport and Sport Plus models have a dual exhaust, which reduces boot space by around 10%.